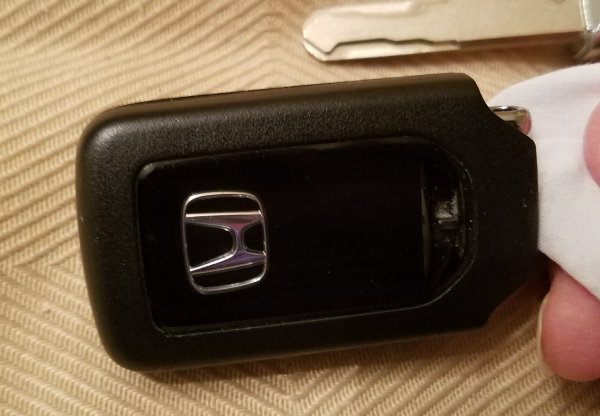 This type of key fob is common on popular 2015-2018 Honda models such as CR-V, Civic and Accord. All this work is hard on the smart entry key’s battery, which only lasts for two or three years with regular use. 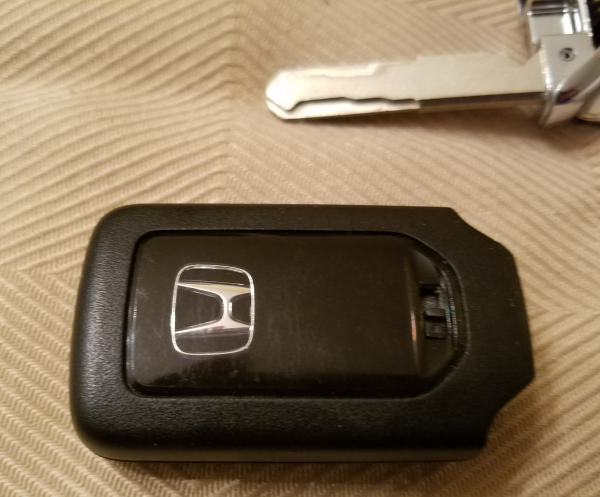 When the battery in your Honda’s smart entry key starts to run low on juice, you’ll see a blinking battery light on your dash, near the odometer. It’s not to be confused with the yellow alert light shaped like a battery that would indicate that your car battery has a problem. This is a smaller light that says “battery” and blinks. 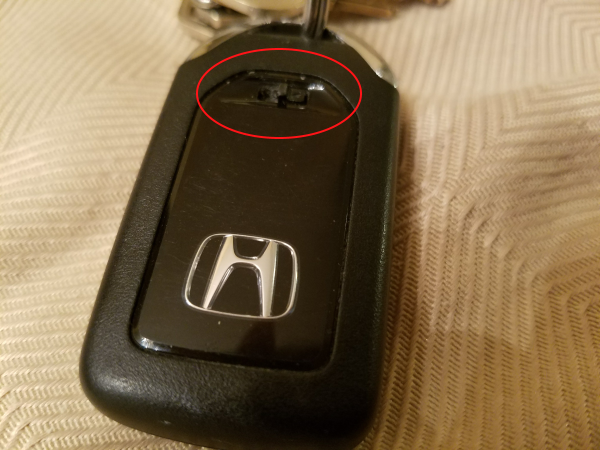 When this happens, you have the option of taking your fob to a Honda dealer and paying to have them replace the battery, at a cost of probably $15 or $20, or more. Alternately, you can easily change the battery yourself in about five minutes. You’ll need a coin and a thin piece of cloth, such as a cloth napkin, along with a 2032 size flat coin battery. Turn over the key fob and find the release for the keychain. Gently push this release button and pull on the key chain to remove it. Next, wrap the coin in one layer of thin cloth, stick it behind the metal piece in the fob and gently turn clockwise until you hear a click, then turn it a bit the other way. You should be able to carefully pry apart the two halves of the fob now. Carefully remove the battery and replace it with another 2032 size battery. This is the type of small, coin-sized battery you might find in your garage door opener remote control or other small RC device. They should cost roughly $5 or $6 for a pack of five. Your fob should easily snap back together, then you can re-insert the keychain part, and you’re in business. Go back to your vehicle and start up the engine. You should see that the little blinking battery light is no longer there. can you explain about Hyundai I20 Key Battery replacement? I recommend performing a Google search to see if someone has posted instructions for that. 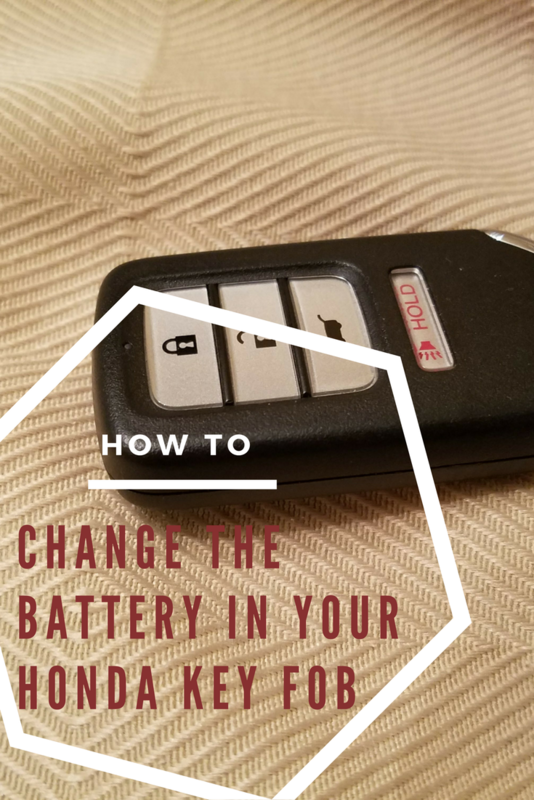 Very Nice information to replace key fob battery. I have Honda amaze. I will use this tips when i have to need. Thanks a lot for sharing this helpful information with us. thank you so much for this tutorial! I changed my battery following your exact directions….and …..voila! worked perfectly! Saved me a 25 mile trip and a $10.00 charge. I had the right battery on hand. That’s great! Thanks for taking the time to comment! It worked exactly as described, the twist both ways worked splendidly. Thanks! I was amazed that this info was not included in the owners manual…guess Honda really needs that $, LOL. 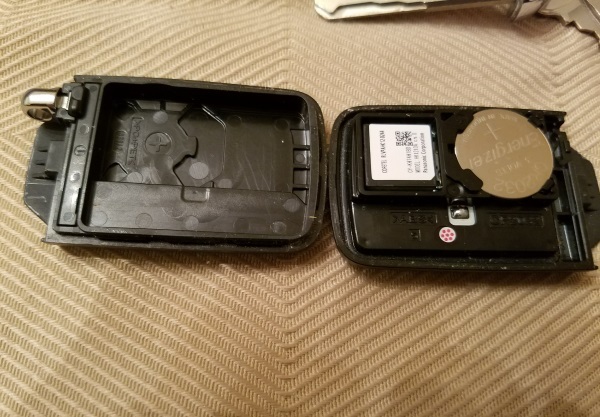 Your instructions worked perfectly and I was able to replace the battery in both fobs in less than five minutes! Thanks for your kind words! I’m so glad my post helped you. That’s great! Thanks for sharing your experience! worked like a charm. thanks for saving me time, money and frustration! Thank you very much for the info. It worked exactly as you instructed! I also went to my owners manual to find out how to do this and came up empty. Thanks for the handy tutorial! I couldn’t find it in the owner’s manual, either! Easy to follow instructions, thank you. Thank you so much for this, it is informative, simple, and will save me the effort. I do wonder, however, any idea how long it will last on low battery before dying? I would assume it has to give enough time for you to be able to replace it, so it can’t possibly die too shortly after getting the warning. Any idea? Hi, Beth! And happy new year from one Beth to another! Thanks muchly for the great auto key fob change instructions! Very clear & helpful! And, yes, living with Beth makes everything better! Thanks for the wonderful instructions. Now hoping between the two fobs, will make it to town to get batteries, lol. Thank you. 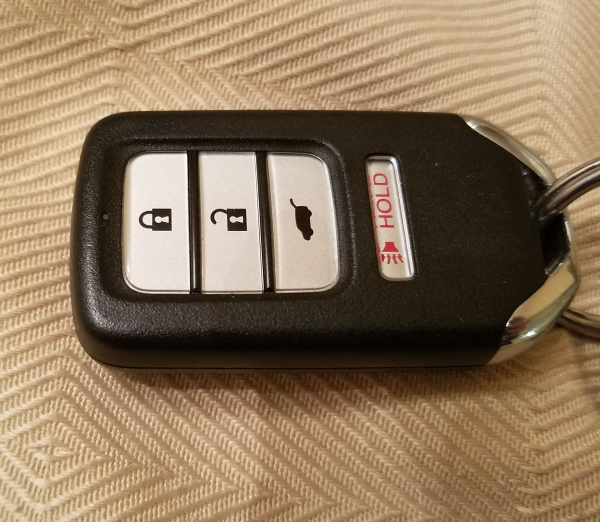 Swapped one with nearly new battery from garage door opener – will get new ones and replace other fob, just in case. Very clear instructions. [Honda Ridgeline]. 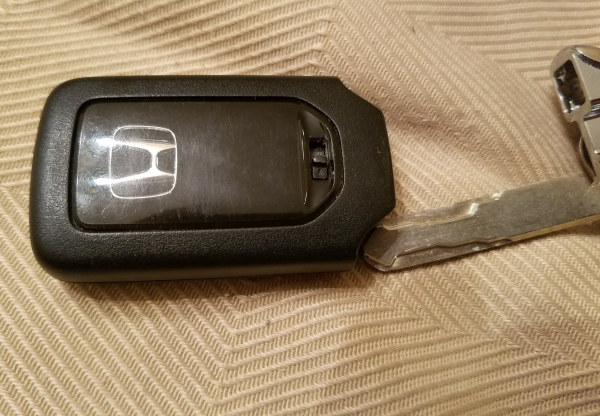 What happens if you replace the key fob battery, but the light remains flashing on the dashboard? Is there a way to reset? I’ve searched the web and owner’s manual, but can’t find anything. Thanks. I’d probably try a different battery. Also, make sure you don’t have two key fobs that are within range at the same time – you might have changed batteries in the wrong one.